Andrew O’Brien talks about how he went from running as a hobby to turning it into a global lifestyle business. This is episode 025 of the Ideas Architect Podcast. We’re talking with Andrew O’Brien. 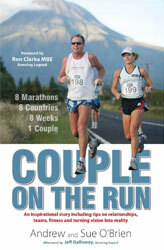 He is one half of the Couple on the Run and Partnerunning with his wife Sue. Their story is how an overweight smoker recovering from chronic fatigue built a global running business with his wife, an Australian representative in triathlon. It’s a great example of how you can apply business thinking to almost anything you might be interested in to create a profitable lifestyle business. Their best selling book Couple on the Run is about running eight marathons in eight weeks in eight different countries as a couple. I’m not sure which is the hard part there… running the marathons or running as a couple. They have now run over 100 marathons together – amazing! Partnerunning is now growing as a powerful running community. It’s centred on a podcast/radio show that is downloaded over 30,000 times a month.